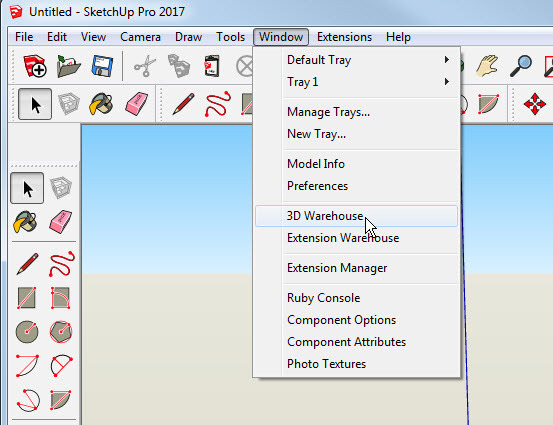 The good folks at SketchUp recently tweaked the features of the 3D Warehouse and it is now possible to “borrow” materials or components from a warehouse model without downloading the entire model. 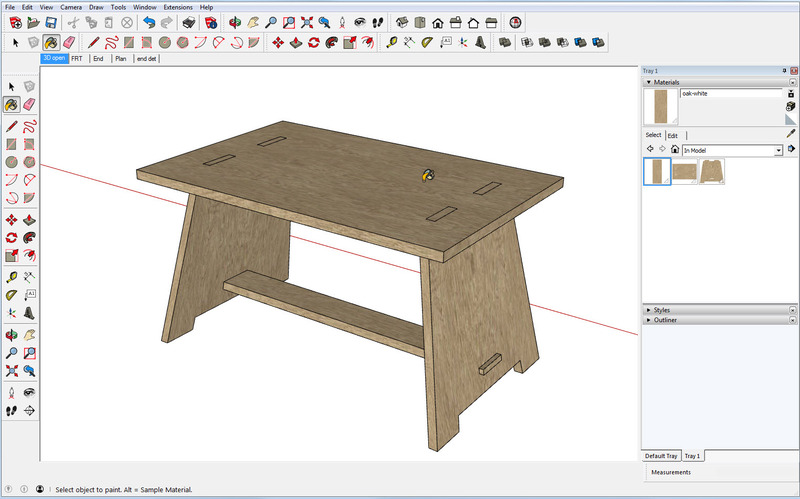 In this example I have a model of a coffee table that could use some woodgrain to make it look more realistic. From the Window menu select “3D Warehouse”. 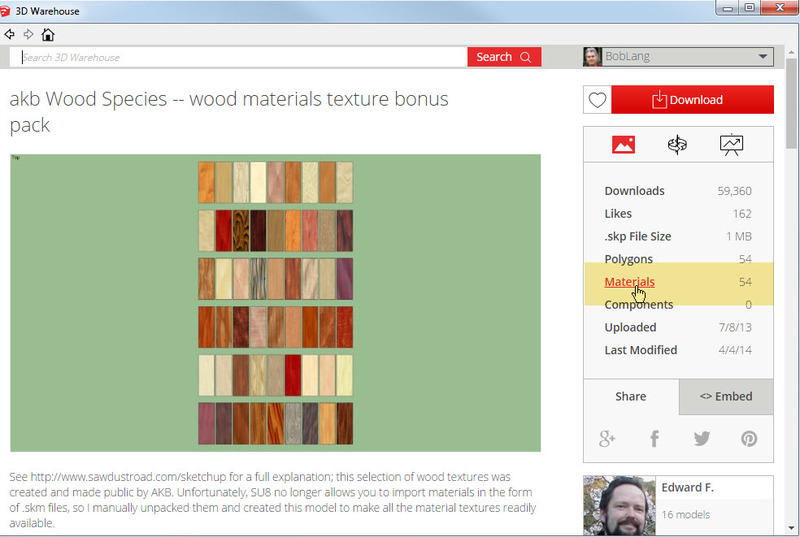 When the 3D Warehouse window opens, type “wood textures” or “wood materials” in the search box. Make sure the box that says models is checked and you should get about 1,000 results. Some of these are collections of several species of wood, and some are models of other things. In the past you had to download a model to get a good look at the materials inside. This model, call “akb Wood Species” has been around for a long time. The model is just a bunch of rectangles, each with a different wood material applied. The images are rather small, so they won’t bog down your model. If you hunt around a bit you can find more realistic, higher quality images. 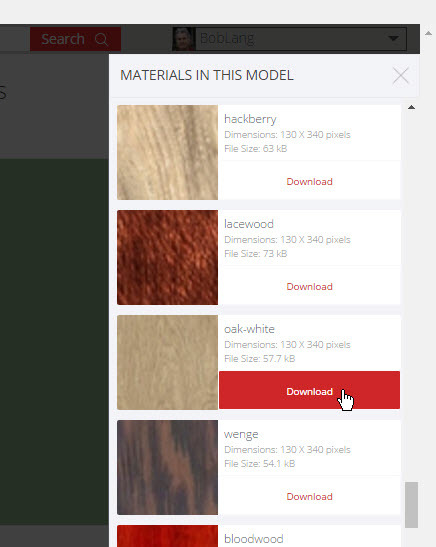 You can download the entire model and all of the materials will show up in your “In Model” materials. You can then save one or more to a folder on your machine. What’s new is in the statistics box to the right of the model image. The word “Materials” is now an active link. Click on the link and you can browse and download any of the materials in this model, without downloading the entire model. What appears is a thumbnail of each of the materials along with dimensions in pixels and the image file size. Larger images look better, but the trade off is that your computer will have more 1s and 0s to keep track of. In my work flow I add materials after the model is finished. After the information about the image the word “Download” appears in red. Click on that and only the material downloads to your computer. 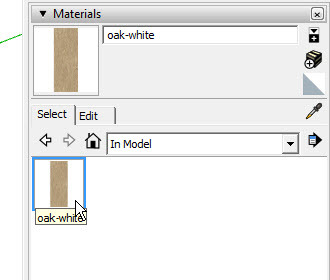 The material image takes a lot less time to download than an entire model, and it will appear in the “In Model” collection in the Materials window. Click on the thumbnail and the “Paint Bucket” appears. With the Paint Bucket active you can apply your new material to objects in your model. If you’re in a hurry and aren’t worried about grain direction, one click on a component (or group) applies the image to all the front faces of the component. If you have time, open the components and apply the image to one face at a time. When a material image is applied to a single face, you can right-click over the face and change the scale and orientation of the image. After you edit, you can save the edited textures as “Unique Textures”. That speeds up the process considerably. When you get the scale where you want it, save one version with the grain running vertically and another with the grain horizontal. I usually caution people about getting caught in the rendering rabbit hole. It can take more time to render than it takes to build a model, especially if you track down the perfect image. At least the process of finding images in the 3D Warehouse won’t take you long at all.